Windows can be any shape and run parallel or perpendicular to the seal flap. Windows are generally parallel to the seal flap but other variations include perpendicular, square, oval, pistol grip and rounded. To ensure an accurate quote on a special window, it is advisable to scan and/or email a drawing to inside sales. Custom window shapes can be made in any shape and size. 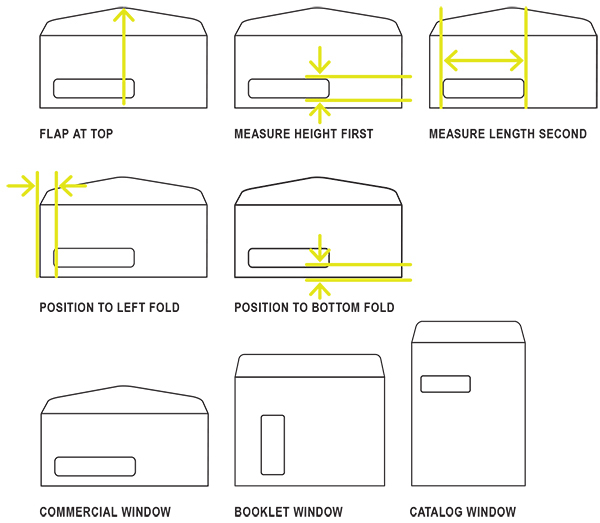 When ordering window envelopes be sure to specify size, position, window material and shape. A commercial flap envelope with a standard window has a 1.125 x 4.5 inch rectangular window with rounded corners. It is positioned .875 inches from the left fold and .5 inches from the bottom fold. Poly: The most popular and inexpensive patching material, slightly opaque in appearance. 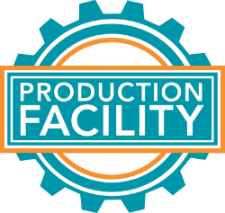 Resistant to humidity, will melt in the thermographic process or high-heat digital printing. Clear: The most popular and inexpensive patching material, slightly opaque in appearance. Resistant to humidity, will melt in the thermographic process or high-heat digital printing. Open Face or Open Panel: This type of window has no patch material added. Special: Environmental window materials available by special order. Glassine: Glassine lacks clarity and does not react well under humid conditions. Safe for thermography, and recyclable, because it is a wood product. Heat Resistant: Recommended for thermography and digital printing.